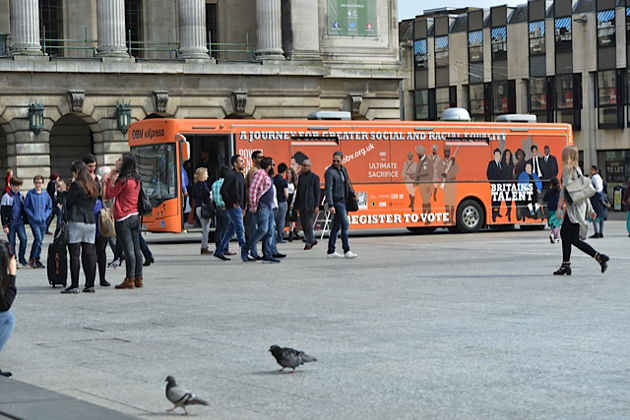 Get-out-the-vote campaigners entered marginal seat Nottingham in an eye-catching orange touring bus. It was bursting with voter registration computers, and a powerful message. Like latter day Robin Hoods, they came to curb uncaring politicians and empower Black and Asian target groups – youth, women, the elders, and faith-based co-religionists. Author’s note: My research suggests that one-stop canvassing once every five-yearly general election cannot bring the needs and views of the aggrieved margins to the centre of public affairs. I sense an appetite for a national umbrella group, with local branches and cyber-organisers with smart media networks and web sites, to add social action to the Black and Asian political agenda for change; an optimistic prospect the Nottingham Afro-Caribbean and Asian Forum (ACAP) and groups in all the marginal electoral districts might feel confident to partner. Prof Thomas L Blair explores the use of Internet and social media by Black communities and scholars to disseminate ideas, and calls for this material to be captured and preserved as part of Britain’s cultural heritage. On historic white working class slums and today’s council estates where many people experience high levels of crime and unemployment, poor health and educational achievement, low skills and low standards of housing and the environment. ACAF, a Voluntary Sector Organisation, assists Nottingham’s Black and Minority Ethnic Communities with projects in Health, Public Involvement, Volunteering, and Adult Social Care. An associated group, Bright Ideas, supports positive changes in the places where BMEs live.